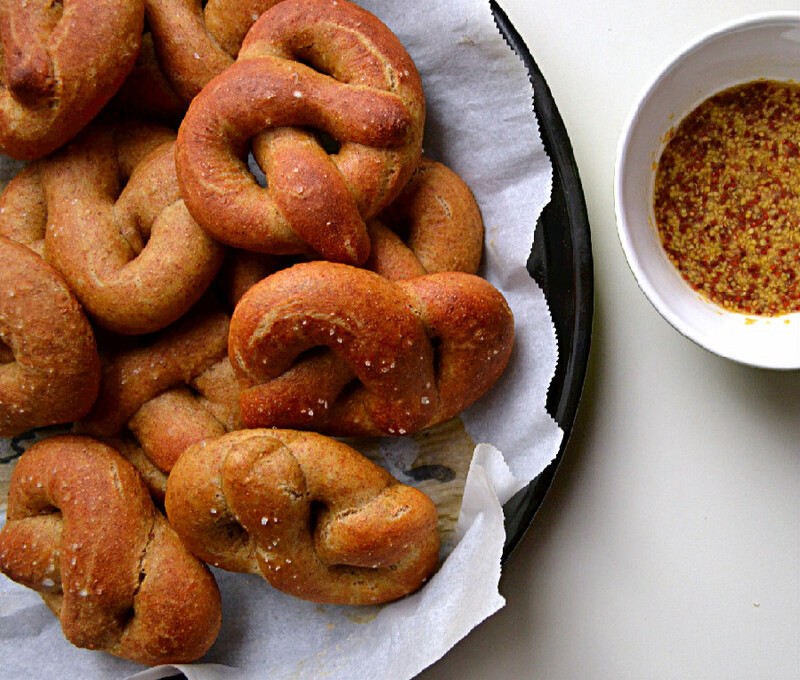 A few months ago, I searched high and low for a soft pretzel recipe that I could make at home only to come up short. I realized after spending an evening with Google that I wasn’t going to find what I was looking for, which was a soft pretzel that was dairy free, egg free, yeast free, refined sugar free, and white flour free. I wanted a simple, no fuss recipe, something I could whip up quickly using whole wheat or whole spelt flour and without the use of active dry yeast. I knew the best solution would likely be a sourdough pretzel and I vowed I would give that a go one day, but this wasn’t going to be the day. My Google search may not have landed me a pretzel recipe but it did give me a brilliant idea – to use a basic Irish Soda Bread dough! Irish Soda Bread is a quick bread made with baking soda and buttermilk which create a chemical reaction to leaven the bread without the use of yeast. Clearly it wasn’t going to be the German style pretzel you would find at a street stand, I thought, but it would be soft and pillowy, much less refined, and a lot healthier and easier to digest without the yeast. I was right! Hubby and I spent that Friday evening making pretzels, me preparing the dough, and him rolling them out because I can’t roll out pretzels to save my life (true story). We ate all 6 in a heart beat, and thought, “we really should have made more/we really need to make these more often”. That recipe then sat on my list of recipes to recreate and post for several months, mostly because, I repeat, I can’t roll to save my life and I needed Hubby’s expertise to roll them out and with our crazy schedules and other recipes taking precedence it never happened, until this past weekend when we spent Sunday afternoon rolling, baking and eating pretzels. This time we made a double batch and they lasted a couple of days. These were really fun to make, good to eat and make for a fantastic weekend project with your significant other and/or kids or for a girls night in. I used a mix of baking soda, baking powder and a mix of apple cider vinegar and oat milk instead of buttermilk which is traditionally used. 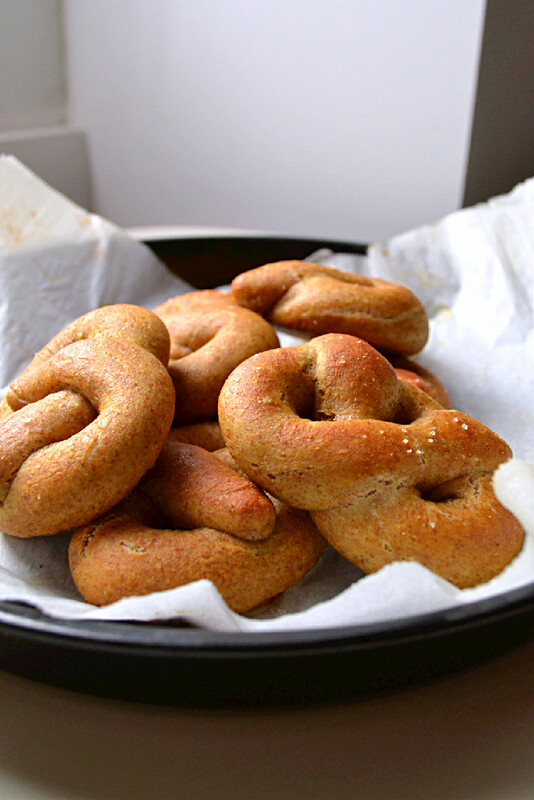 In my pretzel research I also learned that dipping the pretzels in a baking soda solution would allow them to rise even more would allow them to brown nicely. The trick here is to use A LOT of water and a bit of baking soda so that it doesn’t over power the flavour of your pretzels. I found the best combination was 10 cups of water to 1/4 cup of baking soda. These are best eaten on the day of or the day after as they start to taste a little too much like baking soda if they sit any longer than that. I’m not sure if there’s a scientific explanation for that, if you know it, please do share in the comments. Prepare the dough by combining all dry ingredients together in a large mixing bowl. In a separate bowl combine oat milk and apple cider vinegar and let sit for 10 minutes. It won’t curdle like regular milk or soy milk would when you add vinegar, so I’m not sure if the resting time is necessary, but I do it anyways to be safe. Add milk mixture and maple syrup to the dry ingredients and mix well to form a soft and uniform ball of dough. Transfer onto a flowered surface and knead for a minute or two, then separate into 12 equal pieces. Place all pieces back in the mixing bowl and cover with a damp towel. Working with one ball of dough at a time, roll out a 12 inch rope and fold into a pretzel shape. Meanwhile, add 10 cups of water to a large non alluminum pot and place on the stove top. Bring water to a gentle boil, stir in baking soda and reduce heat to low. 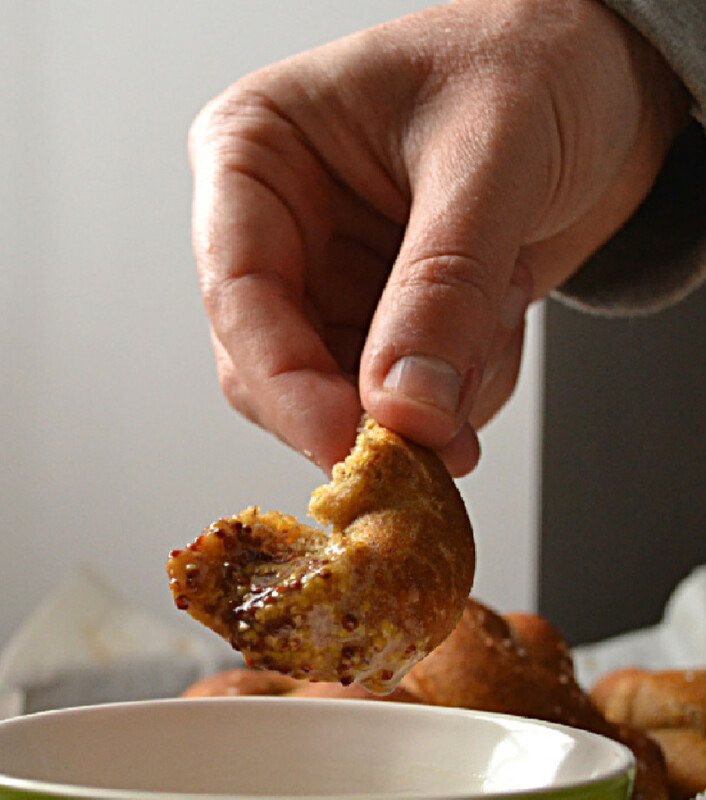 Using a slotted spoon, submerge the pretzels, one at a time into the baking soda solution for about 20 seconds until they rise off the slotted spoon. Scoop them out, letting the water drip into the pot and place them on the baking tray and inch apart, giving them enough room to rise and expand. Sprinkle with salt of choice and bake in a preheated oven for about 15-18 minutes until golden brown, be extra careful not to burn them so keep an eye on them and take them out as soon as you see them browning even if the time hasn’t elapsed, oven times vary. Thank you Chantelle. I’d love to hear how they turn out for you. I’m not sure if a soda bread can be done with almond flour, but it’s an interesting idea. 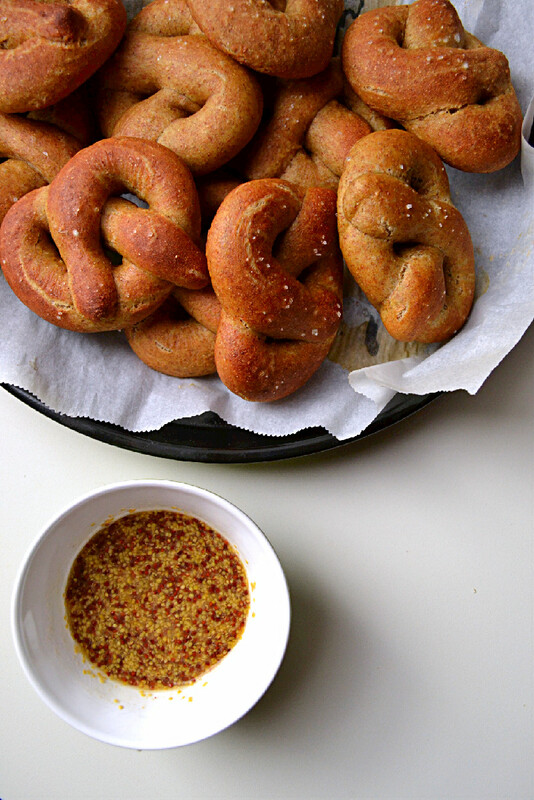 I just literally just finished making a half batch of these pretzels, took them out of the oven like 10 minutes ago. Absolutely delicious!!! I would take pictures but they are kind of ugly. I’ll make again and then share..
That’s awesome, so glad you enjoyed them. We haven’t made them in a while. I’ve been a little put off by the heat wave and not wanting to turn the oven on. Thanks so much Natalie. Hubby and I love them and devour them so quickly each time we make a batch.